Bruna Canepa is a Brazilian architect (Escola da Cidade, 2013) and artist based in São Paulo, Brazil. She co-founded Miniatura (2010 – 2014) and since 2007 takes part in a series of collective or solo exhibitions and publications in Brazil and abroad. She has worked as an illustrator since her teenage years for magazines and newspapers. 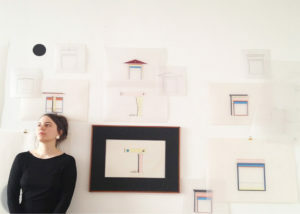 After graduating from the architecture school, she is attending theoretical classes at the school of Arts at Sao Paulo University (USP) where she explores new techniques, painting and exploring the field outside the paper, in order to get closer to architecture and architecture projects. Bruna is working by hand, throughout a fascinating and slow process of creation. She extracts elements from projects, buildings or concrete reality, such as windows, pilotis; and isolate them from their context. 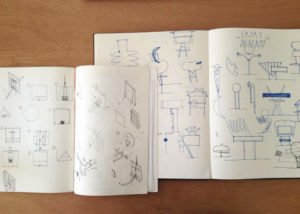 On her notebooks, she collects those elements and step by step creates a collection of archetypes. On a transparent paper of a rather big format (approximately A1 format, but also sometimes A2 format) , she digs into details and realises a proper scale drawing using rulers with lines and graphite. Shortly, she will make another version with ink, by reproducing the lines previously made to composing the final construction of the image. From that point, she will consecutively do series of drawings, trying colors and textures on the paper. For one final image, there is usually 10 to 15 drawings realised in the process. Working with “analog” tools is an essential part of Bruna’s research process. Rotring pens, transparent paper, black ink, parallel ruler, compass, Letraset (plastic tool for instant lettering on sheet), all those are among the traditional tools used by architects back in the days, in which Bruna bases her practice and center of interest. For our first collaboration with Desplans, we decided to present Bruna’s final project she presented for her graduation in December 2013 at Escola Da Cidade. Casa Plano (Plane house) is part of the thesis called 5 casas (5 houses) and is an experimentation on dwelling’s typologies: the house in its more trivial archetype is decomposed, exploded and rearranged through the tensions created by colored surfaces and volumes that cross, cut and break the ensemble. In a house crossed by a plane lives an artist. The house, that has the measures of a warehouse, is an archetype of a home. The volumes clearly determine work and rest. The plane house splits these two spheres of life at the same time that it creates its own microcosm in which both complement each other. The plane divides but also melts together and organizes. Find architect Angelo Bucci’s words about 5 Houses project HERE. 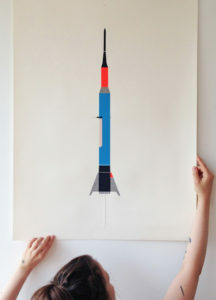 Find Bruna Canepa’s limited editions HERE.